There is a big problem with control joints or contraction joints. They are the saw cut joints we cut into concrete slabs to control cracking as the concrete cures. The problem is the floor owner typically wants the floor poured, joints cut, joints filled, and building occupied in 60 days or less. Concrete cures hard in typically 28 days, but it continues to shrink and crack for a about a year. The contraction joint that was 1/4″ when it was cut, can almost double in width in that first year leaving the 1/4″ of joint filler a bit short, cracked and generally a mess. The sidewalls of the joint are left unprotected and the joint spalling begins. You can replace all that gummy polyurea or brittle epoxy with Roadware 10 Minute Concrete Mender™ and leave your control joint problem behind. Reducing worker exposure to silica dust is an OSHA and job site priority. “Workers may be exposed to dangerous levels of silica dust when cutting, drilling, grinding, or otherwise disturbing materials that contain silica. These materials and tasks are common on construction jobs. Breathing that dust can lead to serious, often fatal illnesses.” The Center for Construction Research and Training. Click here to learn how to work safely with silica. Core sample of Roadware 10 Minute Concrete Mender™ repair shown under UV light. With Roadware 10 Minute Concrete Mender™, you can make excellent crack and spall repairs with much less cutting and grinding. 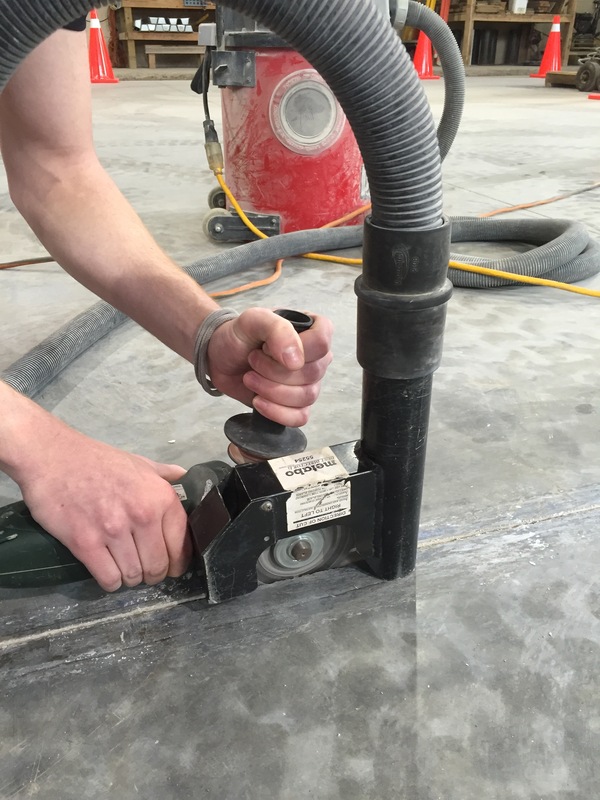 Standard preparation for most concrete repair products calls for invasive actions from square cutting and removal to deep cutting, grinding and sandblasting. Aggressive preparation is necessary for standard repair material like epoxy and polyureas. They are too thick to penetrate and bond to compromised concrete surfaces. Roadware 10 Minute Concrete Mender™ has an extremely low viscosity of less than 8cps when applied with a surface tension one third of water. Concrete Mender™ can penetrate and bond concrete surfaces where other materials will fail. Less grinding and cutting means less dust to mitigate. 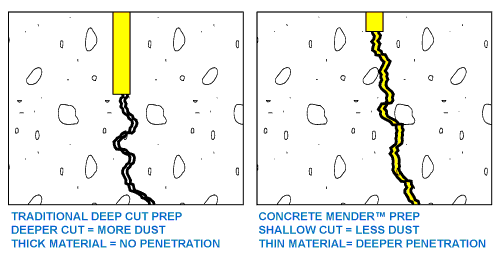 Many concrete crack repairs can be made with Concrete Mender™ with just a light scoring with variable speed diamond grinder. This reduces dust production by nearly 70% over conventional methods. 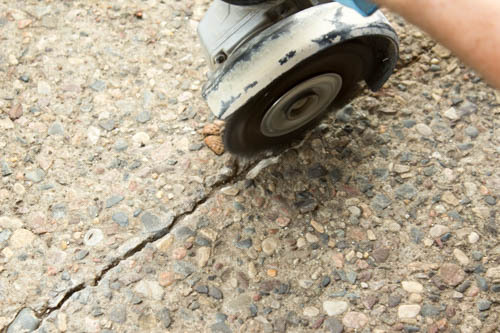 In some situations, cracks can be repaired directly with only a shop vacuum used to remove dirt and dust. 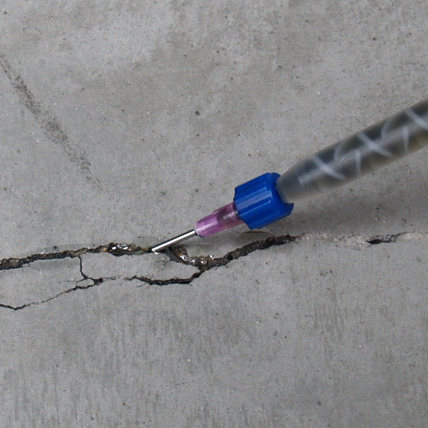 Roadware’s needle tip application mixers are great for getting Concrete Mender™ into small cracks in fissures. 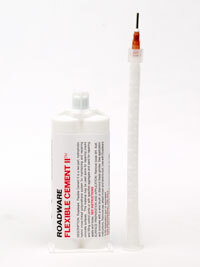 Roadware 10 Minute Concrete Mender™ needle tip application. A wire wheel can be used for preparing cracks and spalls. We recommend using a variable speed grinder with a twisted wire wheel. This generates less dust than diamond blades and still does a good job preparing the crack for a Concrete Mender repair. A wire wheel in a variable speed grinder generates less dust than a diamond cutting blade. After the crack or spall is repaired, grinding and buffing to make the repair flush can be made using wet methods in just 10 minutes after application when using Concrete Mender™. Other low dust methods include razor scrapping and dustless grinding equipment. Wet and damp grinding and polishing reduces dust generation. 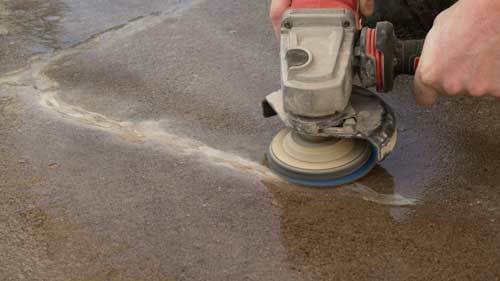 Razor scrapping is a low-dust method of finishing Concrete Mender™ repairs. Whenever cutting or grinding concrete, have a plan to keep harmful dust away from workers and bystanders. Using Roadware 10 Minute Concrete Mender™ with these minimal evasive techniques can help keep dust exposure to a minimum. Question: How do you epoxy inject cracks in floor slabs on grade when you do not have access to the bottom of the slab? What keeps the product from running out the bottom and all over the place?Answer: We make these type of repairs all the time. The first thing to do is dump the epoxy. It is too thick, too brittle, and takes too long to set. Fast setting materials like 10 Minute Concrete Mender allow you to control set points deep in the crack and prevent material seepage.Roadware 10 Minute Concrete Mender™ has an ultra low viscosity of 8cps and will gravity inject into the smallest of cracks. We make the repair in stages adding fine silica sand into the crack as necessary to prevent the material from running out the bottom. The product can be injected with needle tip mixers as small as 18 gauge. With careful technique and experience you can make structural repair that will restore aggregate interlock and restore the slab. Start out by adding a small amount Concrete Mender to the prepared crack and noting where material in running beyond the slab. Add a light dusting of silica sand or fine quartz to the crack and some more Concrete Mender. The Concrete Mender will combined with the particles of sand to form a quick setting, “mud” at the bottom of the crack. Repeat as necessary and repair the full depth of the slab. This will be a structural repair with no ports, no pumps, and almost no down time. Why are my contraction joints spalling and what can I do to stop it? slab to crack at pre-determined intervals instead of natural random cracking. Joint filler is used to protect the joints from spalling and chipping caused by traffic on the slab. 12 months, it shrinks in size and may even curl up at the joints. The contraction joints will expand as the slab shrinks. This causes the joint filler to split apart or dis-bond from the sides of the joint leaving them exposed to traffic. joint. 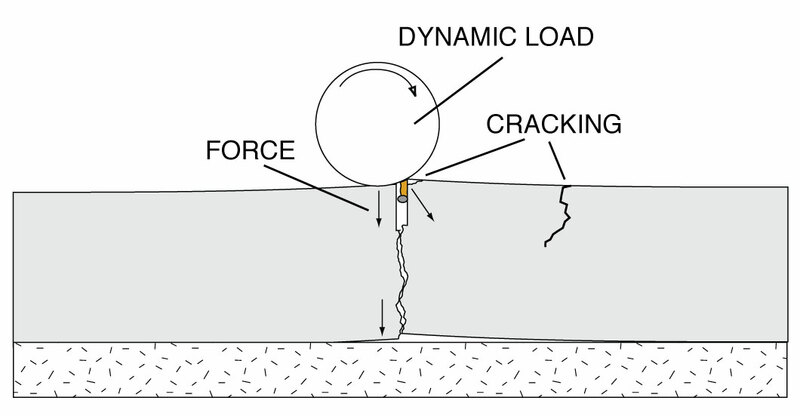 The force of the load has to transfer from the wheel, to the concrete, and to the base. 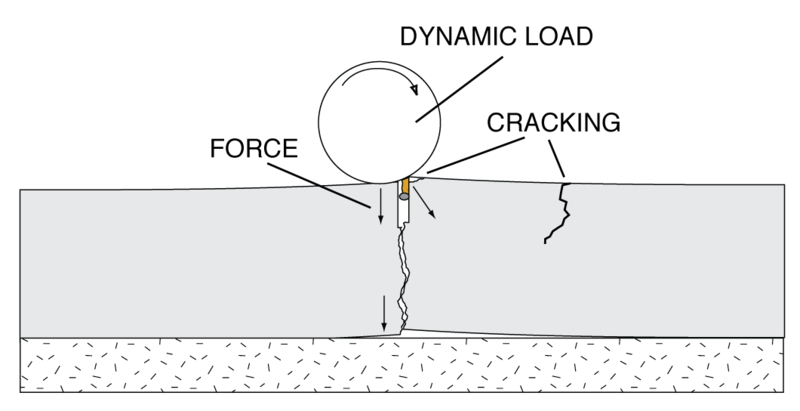 If the slab is even slightly curled and the joint is expanded, the force of the load will impact on the joint causing cracking and spalling. You may even get stress cracking parallel to the joint. You can sometimes feel the uneven load transfer across the joint if you stand with one foot on either side of the joint and have someone else roll a heavy load across the joint. Eventually, you get a spalled contraction joint. The joint filler has completely failed or is missing. Wheels go “thunk, thunk” every time they go over the joint. Productivity suffers, and the joint fills with dust and debris. and allow for complete and even load transfer from the wheels all the way down to the base. Your contraction joint problems are solved. of large repair for compatibility. See how this repair was made by clicking here.